No matter what your experience is in the outdoors, there’s a chance for everyone to get outside this winter and enjoy hiking. If going on a winter expedition to high, snowy peaks isn’t quite your idea of a good time, then don’t give up just yet. There are plenty of trails out there that are beautiful in the wintertime, and that are great for all levels of backpackers and hikers to try out. If you want to practice using those snowshoes, then come to Wenatchee Crest. This area is ideal for hikers who are new to using snowshoes and winter hiking in general, as there is only a small elevation gain. The trail head is right at the parking area near Blewett Pass, and the entire trip is only a few miles. You’ll have incredible views along the way, including those of the Tearaway Mountains and Stuart Range, covered with snow. It’s usually pretty quiet here too, so feel free to take your time. Those looking to really take advantage of the winter beauty should grab their gear and come to Kenai Fjords National Park. If you’re looking for a bit of a challenge, then try the Icefield Harding Trail, where you’ll see spectacular views of the glacier and valleys below, whether or not you go to the top. The trail is 8.2 miles long, but can easily be done in a day as long as you give yourself enough time. It is an icefield, so make sure you have the proper equipment. Watch out for bears! Located in Grafton Notch State Park, the Eyebrow Loop Trail is only 2.2 miles long and though a little difficult because of the steep elevation gain, it’ll be good practice for future hikes that are more strenuous. After you make your way up Old Speck Mountain, it’s advisable to take the Appalachian Trail portion of this trail back down, in order to avoid the risk of falling or getting hurt. There’s also 5 miles of the AT that run through here, if you prefer something just a bit more comfortable. While this park takes over parts of Pennsylvania and Delaware, it’s a quaint and cozy place to do some easy winter hiking. It’s ideal because you can hike in two states in just three miles along the PennDel Trail (Pennsylvania/Delaware trail). This trail, as well as many of the others in the park, provide amazing views of the snow-coated forest, as well as the frozen creek. You can spend lots of time in this park getting to know the trails, finding out for yourself which ones you think are the prettiest this season. The June Lake Hike is a perfect choice for families looking to experience a rather easy outdoor experience during the winter. Located in the South Cascades, June Lake is an absolutely gorgeous sight, and this trail is only a short 2.8 miles long. You’ll get awesome views of Mt. St. Helen’s, see waterfalls, and step through lava flow. It may sound like a lot for a short hike, but that’s the reason it’s so great. Many people also enjoy snowshoeing to June Lake from Marble Mountain Snowpark. 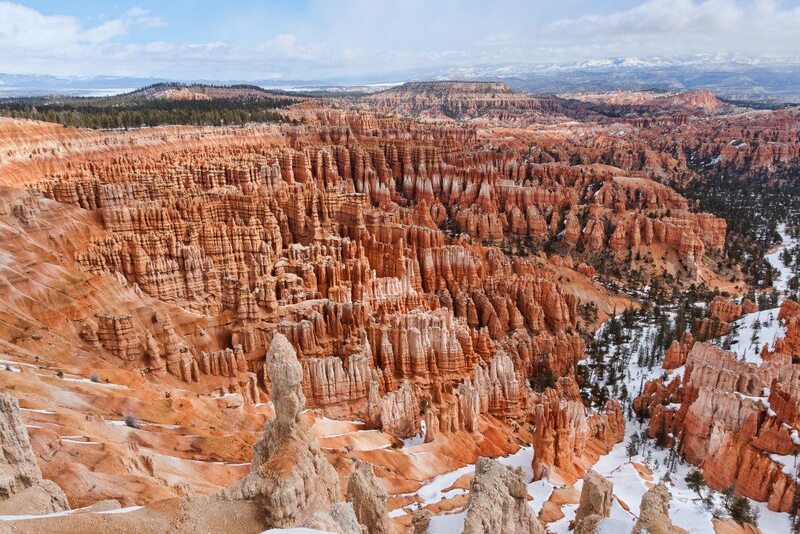 Bryce Canyon is one of the most scenic places in America, and its beauty during the winter months is no exception. The Fairyland Loop hike can be done in a day, but it’s best to take your time making your way through here. This is one of the best places to snowshoe, as the roads are left intentionally covered for your winter hiking pleasure. It’s eight miles, but the terrain is relatively flat and the views of the snow contrasting with the red canyons is like nothing else in the world. Glacier National Park is undoubtedly a great place to experience an authentic winter hike, as you can expect lots of snowfall here during the season. Many people come here to snowshoe or ski through designated trails in the park, and the best trails to do so are those alongside Going-to-the-Sun Road. Though the entire road spans 50 miles, various trail heads stem from different parts of the road, and you can do as much or as little as you’re comfortable with. Keep an eye out for wildlife along the way. Lost Lake is technically right outside the Indian Peaks Wilderness area, which is a fantastic place to do some not-so-intense winter hiking. The Lost Lake Trail is rated as moderate, and the entire trail is almost 2 miles. You can access it from the Hessie Trail head. Along the way, you’ll see a frozen alpine lake, Boulder Creek, and tons of other beautiful winter scenery. Bring the snowshoes along for this one; it tends to get deep here. Keep in mind, any hike in Colorado is usually fair game if you’re looking for a one-of-a-kind winter experience. Bring your dog along, too! Though winter can be a difficult time to hike, there’s plenty of trails out there that can accommodate everyone.